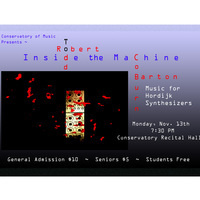 Conservatory composer, Robert Coburn, and guest artist, composer/performer Todd Barton, will present a rare performance of new works for custom electronic instruments designed and built by the Dutch musician Rob Hordijk. Hordijk's instruments capture a warm, natural sound unique in the world of electronic music, while balancing performer control with the surprises of a subtly chaotic system. Todd Barton is composer, sound designer, multimedia performer, and analog synthesist specializing in Buchla, Serge and Hordijk modular systems. After four decades of exploration Barton is still delving deeply into the ever-expanding frontiers of musical expression: from his innovative scores for plays at the Oregon Shakespeare Festival to performances of Zen shakuhachi meditation music and avant-garde music for electronic synthesizers and computers. He gives Skype lessons and consultations in analog synthesis worldwide and is currently a trainer for MacProVideo.com. Todd is fascinated and obsessed with exploring sound and its infinite manifestations. Robert Coburn is a composer/performer deeply influenced by the artistic pursuits of visual artists whose work might be considered minimal (Fred Sandback, Agnus Martin, Callum Innes). For ten years he served as artistic director for the SoundImageSound International Festival of New Music and Visual Image. His music explores a quiet, introspective world of sound punctuated occasionally with joyful, chaotic interruptions. He has worked extensively with technology as a creative performance medium, recently returning to his early fascination with analog synthesis. During the spring, 2017, he participated in a creative residency at the EMS Elektronmusikstudion in Stockholm, Sweden, followed by concerts in London and Tokyo. He is Director of the Composition Program at the Conservatory of Music, University of the Pacific.